Mrs. Will G. PARSONS, 74, died at 2:45 a.m. today at her home at 508 E. Kirkwood after an illness of six weeks. The body is at the Weston Behner Funeral home where last rites are pending. The former Perle Blanche HANSHAW, Mrs. PARSONS had been a resident of Fairfield for 49 years. 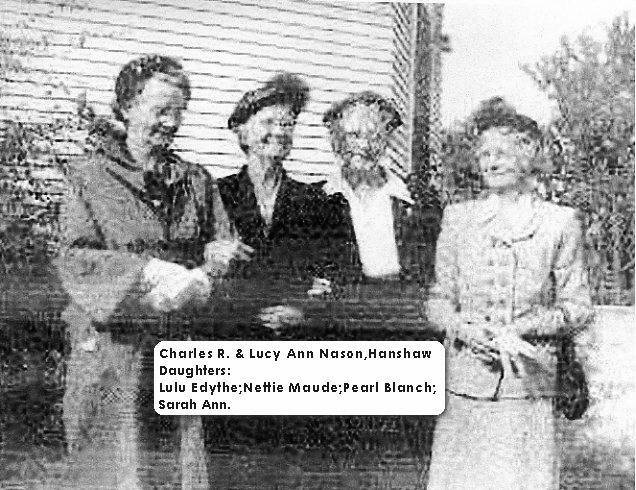 She was born March 4, 1882 at Douds, the daughter of Charles and Laura NASON HANSHAW. She was married to Will G. PARSONS June 24, 1903 at Ottumwa. Mrs. PARSONS was a member of the Presbyterian church and Hawkeye Rebekah Lodge 386. She is survived by her husband and the following children: Milford A. PARSONS, Fairfield; Monte W. PARSONS, Burlington; Wesley G. PARSONS, Miami, Fla.; Lucille PARSONS, Oak Ridge, Tenn.; and Glenn W. PARSONS, Montclair, N.J. Seven grandchildren, three great grandchildren and the following sisters also survive: Mrs. Al LASLEY, Burlington; Mrs. Earl PARKS, Ottumwa; and Mrs. Omar COFFMAN, Agency. Will G. PARSONS, 81, retired mail clerk, died suddenly Sunday morning at his winter home at St. Petersburg, Fla. His son, Wesley G. PARSONS of Fairfield, was visiting his father at the time of his death. The body will arrive at the Weston Behner Funeral home early Thursday morning, where arrangements are pending. PARSONS was born Dec. 25, 1882 at Douds, the son of James and Eliza RAMBO PARSONS. He was a member of the First Presbyterian church and the Elks lodge of Fairfield. He is survived by his wife [sic] and the following children: Milford A. PARSONS of Fairfield, Mont W. PARSONS of Burlington, Wesley G. PARSONS of Fairfield and Mrs. Lucille L. COWEN of Oak Ridge, Tenn.; seven grandchildren and 10 great grandchildren. He is also survived by the following brothers and sisters: J.W. PARSONS of Douds, Leslie J. PARSONS of Hollywood, Calif., Jay H. PARSONS of Gladbrook, Mrs. Ethel B. SMITH of Fairfield, Mark M. PARSONS of Douds, Andrew J. PARSONS of Fox Lake, Ill., Mrs. Etha E. GAY of Hamilton, Ont., Can., Mrs. Eleanor FICKEL of Fairfield and Edna L. REAMS of Brooklyn. He was preceded in death by a son Glenn W. PARSONS. 1885 Iowa State census, Chequest Township, Van Buren County, Iowa; page 108, line #27, dwelling #131, family #130; http://www.ancestry.com. 1900 census, Chequest Township, Van Buren County, Iowa; roll T623-462, ED 93, page 6A, line #42, dwelling #130, family #131.